Tuesday morning saw us wake up to partly cloudy skies. Mum had gotten in to the swing of the Japanese style breakfast but neither of us were game for the natto. 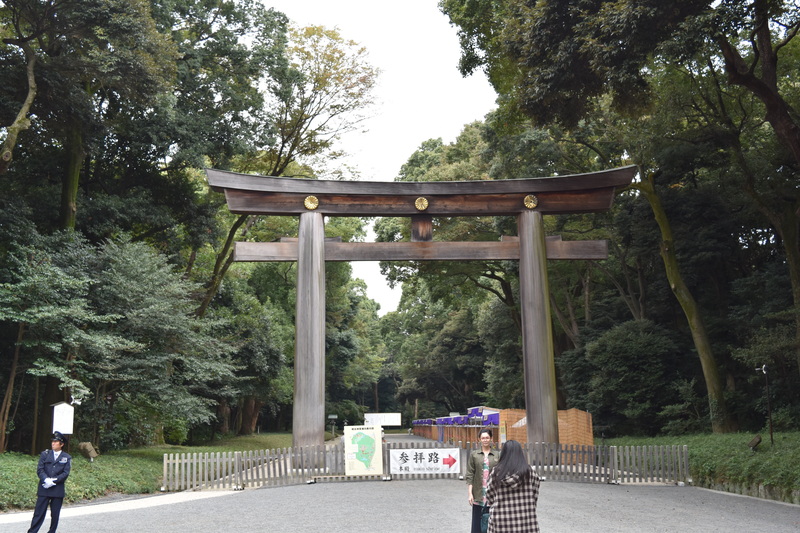 We hopped the train to Harajuku, where there seemed to be less Harajuku girls than normal, and walked in to Tokyo’s oasis of calm.. Meiji-jingu always feels miles away from the hustle and bustle of the rest of the city. Walking through the park to the temple is like taking a walk in a forest, albeit a forest with loads of tourists. Just before we were to make our turn off we walked past the sake and Burgundies used for the consecration of Meiji Jingu. Can’t drink those either Mum. There was some restoration work being done to the large inner torii and they were also setting up for the Autumn festival, so we had to go on a slight detour and approach from the side. From the signage we read they were actually replacing the timbers. In the background you can see the marquees set up for the festival, some of the chrysanthemums were already being placed. Meiji Jingu is a great spot to see the chrysanthemum displays in autumn. We followed the detour signs and entered the shrine complex from the east side, stopping first at the Temizuya to perform the purification ritual. They are doing a lot of conservation work and you can see in the background, on the right, the new section of copper roof. People were able to buy a piece of new copper, write a prayer/wish on it and then this would be used during the reroofing, the cost was ¥3000 per panel. We then walked in to the main shrine complex and saw….another wedding, our fourth for the trip. We wandered around the complex, said a prayer. Mine is always the same prayer, so far it has come true each year. Here are some shots from in the shrine area. We than walked back to Shibuya and along the way passed an amazing mix of architectural styles. We were in desperate need of coffee, so I figured the best place to have one would be Starbucks at Scramble Crossing so we could watch the action. Didn’t seem as busy as some other days I have been there. After our caffeine hit it was across to the station to see the memorial for Hachiko. Finally found it this visit. I am sure you are familiar with the story of Hachi, the loyal dog who waited for his master at the station every day. I think there are two films about him one Japanese and one with Richard Gere. Then we braved the train system to catch a train line I have not taken before, Chuo Line from Shinjuku to Iichigaya. Easy!! I love Tokyo trains!!! From Iichigaya we walked to Yasukuni-Jinja. Quite a controversial shrine as it commemorates the Japanese war dead, and politicians are always getting in trouble for visiting it. While I was participating in the KYLC Kokoda Trek in August, I realised there were not a lot of memorials for the Japanese who fought there. I had this feeling that I should go and visit Yasukuni and pay respects. Having watched a documentary and seeing that both lots of soldiers ended up becoming friends some time after the war and even having get togethers, I felt it was something I needed to do. We entered from the Minami-Mon (south gate) and found the site of the old Renpeikan for one of the three most famous Kendo schools in Japan. We then moved on to the Haiden (Main Hall) where I payed respects to the fallen. Obviously the chrysanthemum symbol on the curtain reflects that this shrine has Imperial connections. Behind the Haiden are the Honden (the main Sanctuary where the divinities reside) and behind that, the Reijibon Hoanden which is the Respository For The Symbolic Registry Of The Deities (lists of the names of deities/fallen soldiers) This list contains the names of nearly two and a half million who have died in action and then been deified. We then wandered around the beautiful old gardens. Many very old trees often with supports, a Shinchi Teien (sacred Pond garden) with huge koi, tea houses sumo ring and much more. After walking the grounds we decided to go in to the Yashukan museum. Below are some of the memorials found outside the museum. The water bottles are not litter they are offerings, there was also some food around too. There are also memorials for animals that have been used in times of war, dogs, horses and carrier pigeons. We were only able to take photos in the general exhibition area, but the rest of the museum was very interesting. I will go again as it turns out I missed one of the display areas and we had to rush through the Second World War displays as the museum was closing. As we walked out a very light drizzle had started and dusk was starting to set in. After another busy day it was back to the hotel via a noodle restaurant. Thanks for dropping by! Next post will be our trip to Fuji-san and Hakone.